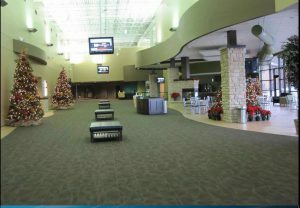 Recently, we’ve been showing photo examples from church building trends we first shared in one of our free i3 webinars. Trends matter to every church leader because they show what types of church design is working in other communities. Before we dive into the illustrations, we need to clarify how the “gathering community” trend differs from “third place design.” As we shared in a prior post, third place design is intended to make your church the “third place” people think about hanging out in, beyond home and work or school. Gathering community is different. It’s critical to include community spaces in your church design so that members have a place to meet, talk, learn and grow when they attend. These meeting places help keep members engaged and give them a place to talk with guests who come to visit and learn more about your church community. One very current church building trend is to increase the size of community spaces. As you can see in these photos of Cypress Wesleyan Church in Columbus, Ohio, their foyer is massive. A few years ago, the standard ratio for foyer space was roughly one-third the size of the worship space it serviced. Today, that size has increased significantly. Sometimes the foyer is half the size of the worship space, while in other church designs, it’s the same size as the auditorium. These foyers now serve many functions, in a way that antiquated, tiny foyers could not. In older, traditional churches, those foyers were simply pass-through spaces. Today, foyers are central to the community life of the church. 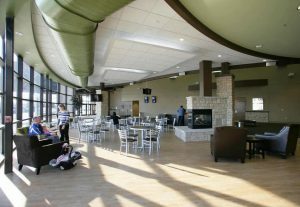 The café and fireplace you can see in these photos help make the foyer feel warm and welcoming, while the square cushioned benches provide small gathering spaces for community to grow. As you can see in this image from Grove City Church of the Nazarene, church building trends in gathering spaces aren’t limited to foyers. 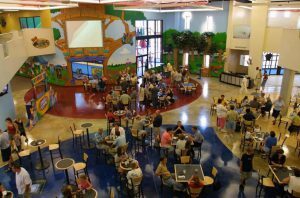 Grove City Church chose to focus one gathering space around its children. This bright and welcoming space is at the entrance to the preschool wing. Here, adults can gather to build community while their children can play nearby or participate in scheduled church activities. Any guest who visits this space will know that Grove City is making children a priority, and that supporting community for their parents matters too. Are you thinking about community gathering spaces as part of your new church design or church remodeling project? We share our i3 webinars for free because we know there are many different facets to a successful church design to consider and implement. To learn more, sign up for our next i3 webinar today.